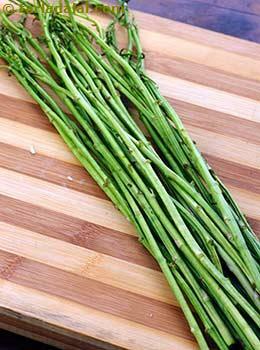 Popularly known as shatawari, asparagus is an elegant vegetable with unique flavor. The glycemic index of asparagus is 15 which is low, while the glycemic load of 1 cup of chopped raw asparagus is 1. It is the powerhouse of innumerable health benefits. Asparagus is one of the vegetarian source of folic acid. Folic acid plays an important in the formation of red blood cells. Its presence also prevents neural tube defects, helps in protein metabolism and DNA synthesis. Is asparagus safe for diabetics? The glycemic load of 1 cup of chopped raw asparagus is 1 which is significantly low and perfect for Daibetics. Due to relatively low amount of carbohydrates (3.2 grams in 1 cup of chopped raw asparagus), the blood sugar levels will not spike up instantly. The fiber content in asparagus will further add on to the slow absorption of nutrients. Thus blood glucose levels remains stable. A research study says that asparagus is a vegetable that keep away your diabetes by increasing the output of insulin-a hormone that helps in the absorption of glucose. Folic acid significantly reduces the homocysteine levels which is harmful for heart. Being a good source of potassium, asparagus aids in regulating blood pressure and muscle contractions. It contains antioxidant called glutathione which reduces inflammation, the root cause of diabetes as well as other lifestyle diseases. Is asparagus suitable for weight loss? Asparagus provides remarkably low calories with negligible amount of fats. In fact 1 cup of chopped raw asparagus contains only 16 calories. This makes asparagus a popular vegetable to be incorporated in the balanced diet for weight watchers. The fiber and protein content in asparagus contributes in increasing the satiety levels. Thus controls your appetite. Try replacing recipes laden with calories by including shatawari in it and making it a healthy one. Try mixing asparagus in your salads making it healthier.